Gorging on a sumptuous thali while enjoying the sea view sounds desirable, right? Well if you have the appetite and have been craving the sea, then Revival Restaurant in Girgaum is your haunt. The entrance is through a narrow lane with tall buildings on either side with an old-school classic look. The exteriors are beautiful and the carved railings just adds to the whole Rajasthani feel of this place. A wall full of accolades and certificates, and Bojhi, the mascot, standing there with a seemingly full tummy and a satisfied smile makes for a warm welcome. Recessed lighting, brass artefacts, servers wearing Indian attire and tables already laid down with copper thalis neatly covered in cloth automatically makes you award them 10 extra points for hospitality. Revival Restaurant is a vegetarian place known for their thalis – a lavish spread of dishes that includes dishes from various parts of the country. 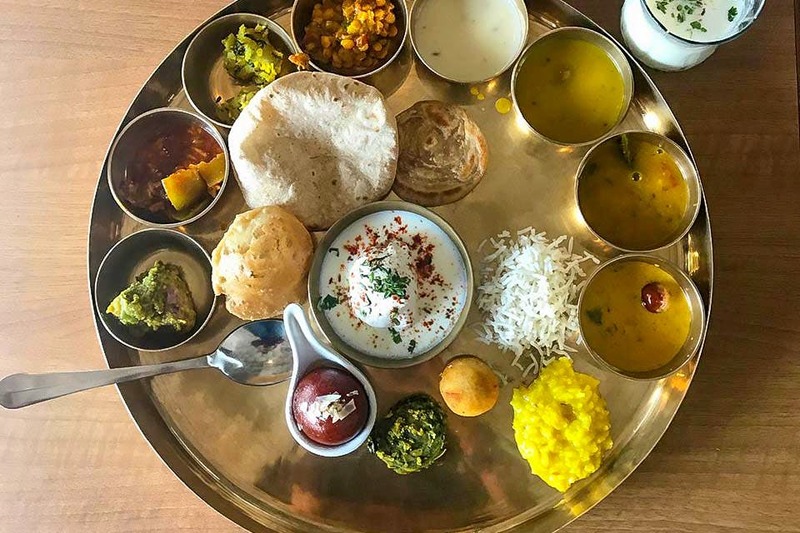 Their Revival Golden Thali (INR 449) is an unlimited thali that serves four vegetables preparations, four types of dals, served with types of rotis and puris, two types of rice, three farsans, a sweet (to be picked from a choice of three), chaas and aam panna along with pickle and pappadum. If you’re not in a mood for that wholesome a meal, there is a whole bunch of things to pick from their a-la carte menu. Start with their Karari Roti – a fried Indian bread seasoned with finely cut vegetables and spices. Then move on to their kebab platter, corn fritters, paneer khada masala and cheese garlic naan. And we recommend churma, or gulab jamun to end your meal. What’s even better is that they make you rinse your hands the traditional way on your table itself, and serve after-food digestives in a magical lamp. They have a fully active bar that serves all your usual choices. Besides that they have an elaborate cocktail menus that comprises of sassy sangrias (INR 375), #MakeItLong drinks (INR 400 for 400 ml, and INR 700 for 700 ml), classic options like caprioska starting at INR 400 and other signature choices (INR 550) like their pineapple and cardamom martini, or revival sour. Head to Revival Restaurant for a relaxed, wholesome meal that will fill your tummy, and make your soul happy with the sea view.